The UAEJJF went all in on the cash prizes for its first King of Mats tournament which took place at the end of April during the prestigious World Pro event in Abu Dhabi. The organization offered $30,000 for the winner, $10,000 for second place, and $5,000 for third, plus an added bonus of $5,000 to the winners of “Best Match” and “Best Submission” of the event. Jamie Canuto and Roberto Satoshi are among two of the most innovative professional ju-jitsu athletes on the circuit today—and a match between the two seems simply too good to be true—but it went down at the 2018 King of Mats. 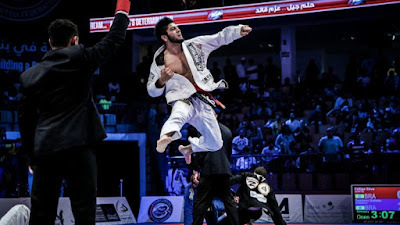 Though their middleweight semifinal was up against incredible matches such as Alexander Trans vs. Roberto “Cyborg” Abreu and Gianni Grippo vs. Isaque Paiva, fans agreed that Canuto and Satoshi put on THE premier match of the event, awarding them with the most votes. Nominees for best submission included incredible finishes from Alexander Trans against Cyborg, Roberto Satoshi’s slick triangle, and more, but it was Renato Canuto’s leaping armbar against Clark Gracie in an 85kg round-robin match that claimed the most votes and the $5,000 cash prize from the UAEJJF.